Family farm holidays don’t come much better than at the tongue twisting Cwmcrwth Cottages in Carmarthenshire. Making friends with adorable Oxford Sandy Black pigs and piglets will have children and grown-ups squealing with delight and there are lots more animals to get to know, including a flock of free range chickens, hairy Highland cattle, shaggy Cotswold sheep, Toffee the pony and, not forgetting, Dora and Gertie the goats. Cwmcrwth is a small working rare breeds farm, where Farmer Rob and Fiona have converted three stone barns into gold award-winning cottages and offer families a really hands on experience of all the fun of the farm. Throughout the year there is always something going on for children to see and to get stuck in, from ‘lambing live’ and handling baby chicks in the spring, to collecting eggs for breakfast, feeding the animals, walking the goats and helping with the mucking out. 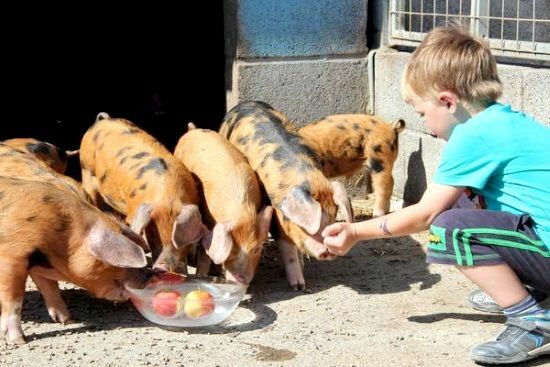 For families who are really keen, the owners also offer ‘Junior Farmer Days’ during which kids from 5-12 from can spend the whole day being a Farmer and looking after their own animals. Adults and teenagers can also get involved and try their hand at making cheese and curing bacon, or even take a pig keeping workshop, which allows children to join in with sausage making. The home reared and home cured bacon and sausages are also available as breakfast boxes from the farm shop. 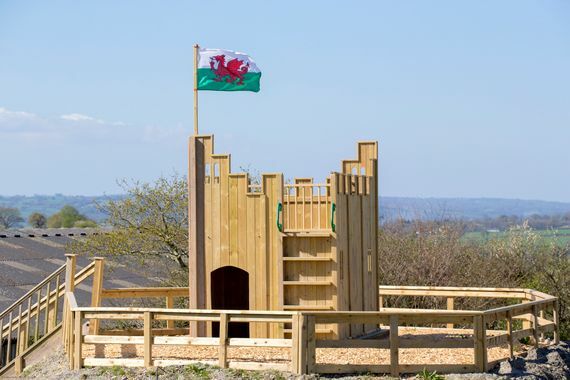 Cwmcrwth offers more fun than just farming as children can happily play the days away amongst the huge list of play gear including a fantastic newly built castle on a hill – perfect for playing knights and princesses! 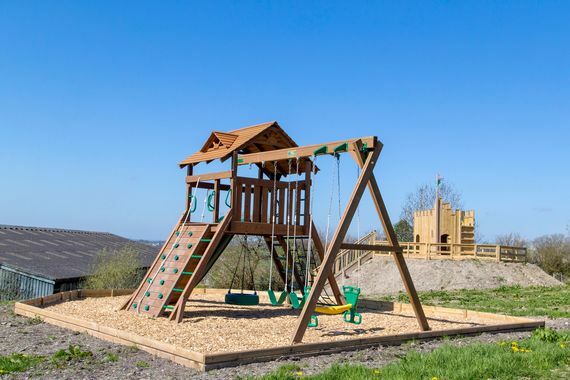 On top of that, there’s a Little Tykes playhouse and climbing fort, swings and slides, a trampoline, a sandpit and ride-on tractors and diggers. Or they can simply enjoy nature or simply enjoy nature by paddling in the streams that skirt the ground. There’s so much to do at the cottages that it’s almost impossible to drag junior guests away! Even if the weather doesn’t cooperate, there is plenty to keep kids amused indoors too. The owners provide baking boxes with farm animal biscuit cutters and craft boxes for making animal masks. Plus two cottages have games consoles, and all three have a selection of toys, books and board games, freeview TV, DVD player and DVD’s. 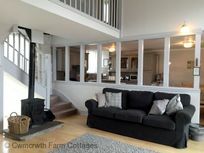 Cwmcrwth Farm Cottages comprises The Hayloft (sleeps 4), The Milking Parlour (sleeps 6 + baby) and The Coach House (sleeps 6 + baby). 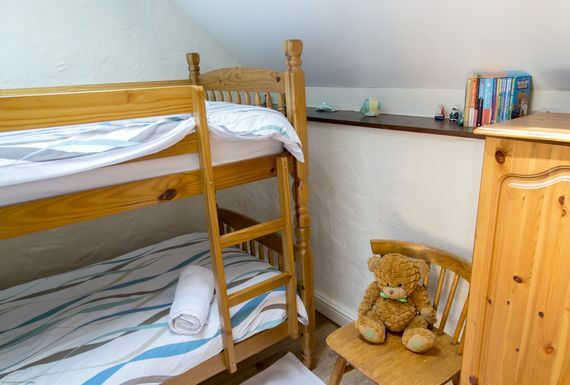 The cottages can also be exclusively booked for larger groups of up to 16 family and friends (+ babies). Two travel cots are available as well as three high chairs, a steriliser, baby bouncer, a potty, stairgates, bed guard, plastic crockery and cutlery. 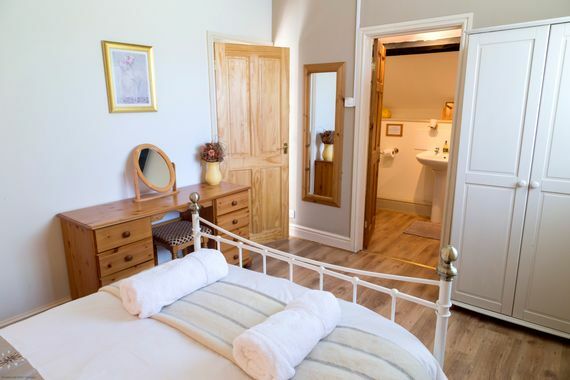 The Coach House comfortably sleeps a family of 6, with one double ensuite bedroom, one twin bedroom and one bunk room. The ground floor has an open plan layout, with big barn doors flooding the space with light and a first floor gallery overlooking the living area. The living room features a comfortable sofa and armchair, wood burning stove, freeview TV/DVD player, Game Cube and a dining table, whilst the contemporary kitchen is well equipped for family self catering, including an electric hob and oven, dishwasher, washing machine, large fridge freezer and microwave oven. A switch back staircase leads to the first floor gallery and three bedrooms. The double bedroom, with space for a cot, has exposed beams, views over the garden and an ensuite with a walk-in shower, WC and washbasin. The cosy twin bedroom (with space for a cot) and bunk bedroom are tucked under the eaves, with exposed beams and Velux roof lights with blinds. 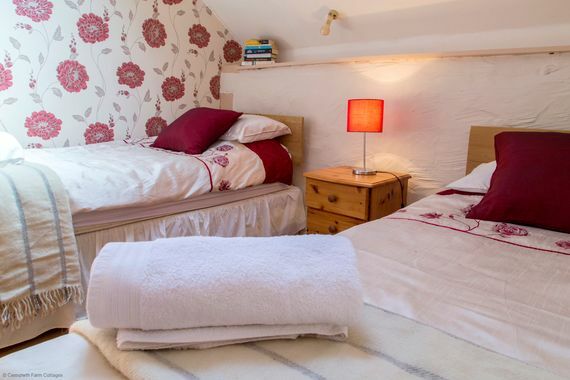 Quality bed linen and fluffy towels are included. There is family bathroom on the ground floor with a bath and overhead shower, washbasin and WC. The Coach House opens onto the sunny courtyard at the front and there is a large patio and the garden at the rear for children to play and to have BBQ’s. 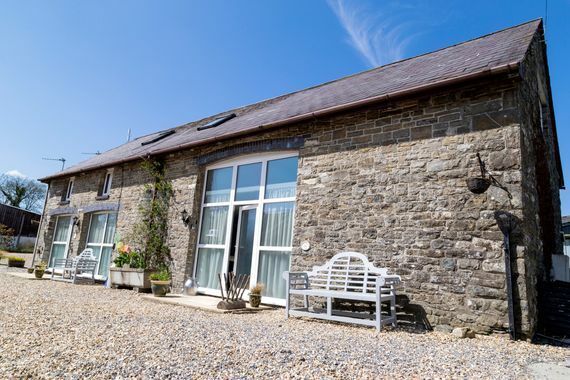 Cwmcrwth Farm Cottages are located in the rural countryside of Carmarthenshire, just West of the Brecon Beacons National Park and 25 minutes drive from miles of dune backed sandy beaches and rock pooling bays. The picturesque town of Llandeilo is just three miles away, with its reputation for chic designer boutiques, antique shops and funky gift shops in its twisty little streets but also providing all the food and essentials stores, cafes, pubs, restaurants and takeaways that families will need during their stay. Children will be dragging parents into Eve’s Toy Shop and people come from miles around for the handmade chocolates at Heavenly, whilst their award-winning ice creams come in some weird and wonderful flavours, as well as all the old favourites. Not forgetting the Toast factory shop! Superb local food is such a feature of Carmarthenshire that several ‘food trails’ lead visitors to some of the best markets, artisan producers, renowned restaurants and gastro country pubs. The markets in Carmarthen and Llanelli are especially worth a visit and local specialities include Laugharne salt marsh lamb, Tywi trout and sea trout, Carmarthen Bay shellfish, locally harvested laverbread and award winning cheeses. The Carmarthenshire coast (17 miles) boasts some of the most beautiful beaches in Europe, from vast swathes of super-flat beaches like Pendine Sands (historically used for land speed record attempts) to dune-backed Cefn Cidan and the Millennium Coastal Park at Llanelli. Laugharne on the River Taf estuary was immortalised by Dylan Thomas’ under Milkwood description of "..sloe black, slow, black, crow black fishing boat-bobbing sea.." and Llansteffan beach is brooded over by a 12th century Norman castles. Within easy reach of the farm, there’s an abundance of ancient castles, stately homes and fun family attractions to explore. Top recommendations include panning for gold at the Dolaucothi Goldmines (10miles) and the brilliant Oakwood, Manor Park and Folly Farm theme parks, and all-weather attraction including the Blue Lagoon swimming complex and the 20,000 ‘Play King’ soft play, bowling, go-karting and cafe in nearby Llanelli. Just down the road (2miles), Aberglasney House boasts one of the most beautiful gardens in Wales and even children will appreciate the Yew Tunnel and woodland trails, whilst Dinefwr Park (4 miles) has a 12th castle and over 100 fallow deer roaming the grounds. The National Botanic Garden of Wales (10 miles) rivals the Eden project with over 8000 species of plants in different themed gardens and has the world’s largest single spanned glasshouse, designed by Lord Foster. Cardiff Airport is 1,5 hrs drive away. Cardiff Airport is 1.5 hrs drive away. Sandy beaches are within a 25 minute drive. There is a farm shop on site selling farm produce and goods. 2 travel cots, 3 highchairs, baby bouncer, steriliser, potty, 2 stairgates, 1 bed guard, socket covers, plastic crockery and plastic cutlery. Bath toys, kids books, U-rated kids DVDs, Childrens toys, board games, baking boxes with farm animal biscuit cutters and ingredients, craft boxes with paper card animal stickers and pencils and crayons and a Game Cube. Play castle, buckets and spades, ride-on tractors and excavator, climbing frame and swings, sand pit, paddling pool, Little Tikes play house, trampoline also nets for pond dipping and pond dipping area (fenced but children should still be supervised). Swing ball and badminton. The farm is home to pigs, goats, sheep, cows and chickens. little ones get involved in daily feeding, and egg collecting rounds. We had a wonderful stay with our two year old and grandparents. The animal feeding each day was a highlight for our son who got to feed lambs, goats, pigs, chickens and rabbits! Fiona and Rob were excellent hosts. Highly recommended.